LIO Fellow Hon. 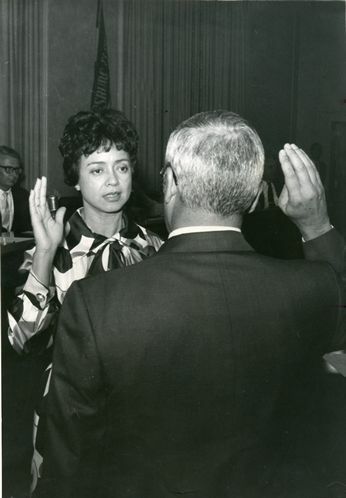 C. Bette Wimbish worked with newly organized Florida Libertarians and across party lines to suppress bigotry, make it the first jurisdiction with a strong transparency policy, and bring direct democracy to amend its Constitution to Florida. She was the first African-American in a city council in Pinellas, Florida, which now has 30,000 LIO fans and interest-group correspondents. Today, key citizen initiatives in Florida have a character influenced by the LIO Libertarian dialogue models and tools--from equality for all political parties to recent work on medical marihuana and tax immunity for low-income homes. Are you a L/libertarian? Informally, if you're a Liberal/progressive interested in SMILE-type voluntary solutions, you're ready for the next step: Formally, unless you're on the LIO d-base, generally, no. 'Libs' or L/libertarians are either appliers, advocates, or auditors which should never be confused with each other. To be a formal small l-libertarian applier you must be on our d-base; to be a large-L pledged Libertarian advocate/student you must have taken the Libertarian member certification to advocate rights via voluntary/federalist solutions and non-initiation of force and be on the LIO d-base or one of the www.lp.org or correspondent national civic organization. If you support LIO and Libertarianism informally you're a libertarian-receptive or voter as the case may be, or may call yourself pro-libertarian or an informal libertarian/aware Liberal. To see where you're most receptive in legal issues, check out: http://www.theadvocates.org/quiz/quiz.php In practice, unless you wish to be recognized by LIO as engaged in a long course of study and activism, saying 'LIO Fan' is sufficient. 1. Civil Libertarianism: Voluntary eco-tools, all fields (SMILE). 3. Civic (with LIO curator): Libertarian model eco-homes/-community legal. Libertarianism is in all fields.When people think of Libertarianism politically, they mean 2 and 3: these may be summarized as easing use of voluntary solutions via SMILE-interested democracy, federalism, localism increasingly legalizing ideal home models with a growing center of LIO fans. The US State of Florida, moved by LIO Libertarians from one of bigotry and opaque systems to "the US Switzerland" of secular and highly transparent direct democracy and local autonomy with no income tax and homes protected from liens and excessive tax...and a large LIO fan plus libertarian-receptive voter presence ( in 2002 15+% voted for pro-Libertarian candidates), is what a growing number of LIO fans see as the initial model for all nations/regions under 40 millions: A world of loosely confederate and peaceful Floridas, with many LIO fans and supporters. Formal Participation:.. in the Libertarian world community is also via these 3 levels: You're either a libertarian applier, Libertarian advocate, or LIO auditor. The distinctions re-affirmed in 1969 are similar to what is seen in most fields such as computers to accommodate levels of knowledge and participation: Casual appliers/users; serious advocate/students; auditors. 1. Our low-key small-l libertarians are appliers/users or LIO Fans who tend to use 1 (SMILE) to better home to civic life, and in non-partisan support SMILE-receptive (libertarian-oriented) participative Liberal eco-democracy. (Outreach registration is presently closed but you may get on our d-base via an e-mail to LIO Friends, right). Many are deeply interested in spreading eco-zones, unions, citizen science, robot and co-op solutions towards a leisure society of plenty for all. 2. Those who focus on 2 are pledged Large-L Libertarian -directional (directional means federalism/user-localism with attention to either 3 and/or a ‘small-is-beautiful’/more rights dialogue) advocates/students of respect for the 30 UN/their nation's constitutional rights: Via choices of principled-voluntary, punishment-free, proactive, and peaceful tools--thus not advocating initiated force by any person, group, or official body (This Gilson pledge was first shared in 1969, launching the modern movement. You may register with us or via the www.lp.org or correspondent groups; after 20 years you may apply for full 'large-L Libertarian status with LIO). These may take a variety of economic forms in each federal/local area. Currently many are very interested in legalizing local autonomy, pure free market and voluntary socialist communities zones, or in general more-voluntary and rights-sensitive solutions in common (so-called governmental) services/regulations. 3. Libertarian LIO auditors are very high-IQ homes or senior advocates working directly with the LIO curator using 1-3 to better progress. History: Please note the term Libertarian is derived from the Iberian for freeholder who championed justice and city rights--not liberty per se, but justice and free speech. Their voluntary Libertarian communities of old, many around the garden republic of Monfort Lemos--where all voted even in the Dark Ages--inspire many. Historically, Libertarian is thus a citizen rights-watchguard and facilitator status and in the future Libertarian (model LIO) communities, and will have an added meaning as these are implemented and spread. In 1964 the last surviving Libertarian communities of the Ancient World centered about the Lemos community tasked the LIO curator with alone forming and certifying modernized model Libertarian homes and communities and attendant model philosophy and standards, as a convenience for LIO fans and to interest the public. Positions: LIO fans and libertarians in general are interested in protecting the process, not positions. They often are on 'both' sides of an issue united in dialogue for voluntary solutions. The LIO curator provides lines of dialogues and models, and in consultation with leading fans suggested reading in many fields. Spokespersons: Only the LIO curator speaks for LIO Libertarianism, and then only on suggested dialogues or his model, and usages of the LIO community; status of advocacy libertarian-direction projects nationally are spoken for by autonomous Libertarian-direction national group chairs in correspondence with www.lp.org : No academic, candidate, or writer speaks for LIO Libertarianism, or anyone but the national chair for local libertarian-directionism (which being directional varies often from LIO civic Libertarianism or 3, and is not referred to without qualification or obvious context as 'Libertarian.’ The www.lp.org notes on its website its mission is to place people in public office to help move policy in a libertarian direction i.e. not strict Libertarianism ). It's always incorrect to refer to (small-) libertarianism as anything but the SMILE agenda for dialogue. The LIO does not share its d-base, but surveys fans periodically: Other purported surveys thus have no standing, except as possibly indicating the use of SMILE by informal receptives and hence, shifts in general opinion. The LIO curator helped create both the modern Libertarian-direction and Green parties to foment libertarian-directionism and -orientation as public conveniences: their platforms were set by him but LIO is non-partisan: LIO fans are encouraged if so inclined to non-partisan local and preferably appointive/volunteer public office such as advisory boards, judgeships, or neighborhood councils.